Unfortunately the thread on the top of the cap stripped and I lost the clip in the first few days. It still writes well though and I use it when I consult the I-Ching. 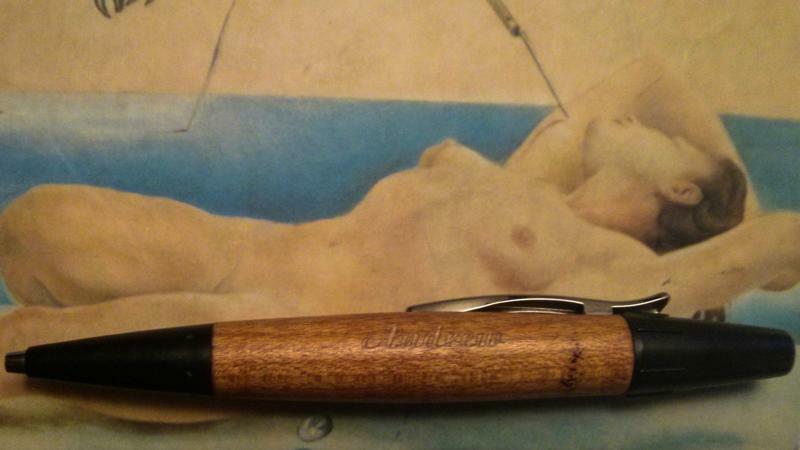 I also use a wooden Faber-Castell ballpoint, which is beginning to run out of ink, so I was looking for replacements. I wasted a couple of hours trying shops and department stores, the days must be numbered for bricks-and-motor outlets. So I went on-line, to Amazon and it’s then I came across the Pelikan Twist. Even just looking at the images on-line I was quite taken with the design. Even more impressed with the price. 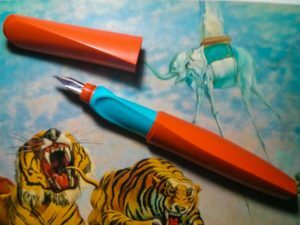 I now have a Twist fountain pen in orange and blue and a roller-ballpoint in red and green, and considering their reasonable price I’m buying them for those around me. So nice to buy good design at such an inexpensive price, that being €6,95 for the rollerball and €7,95 for the fountain pen! 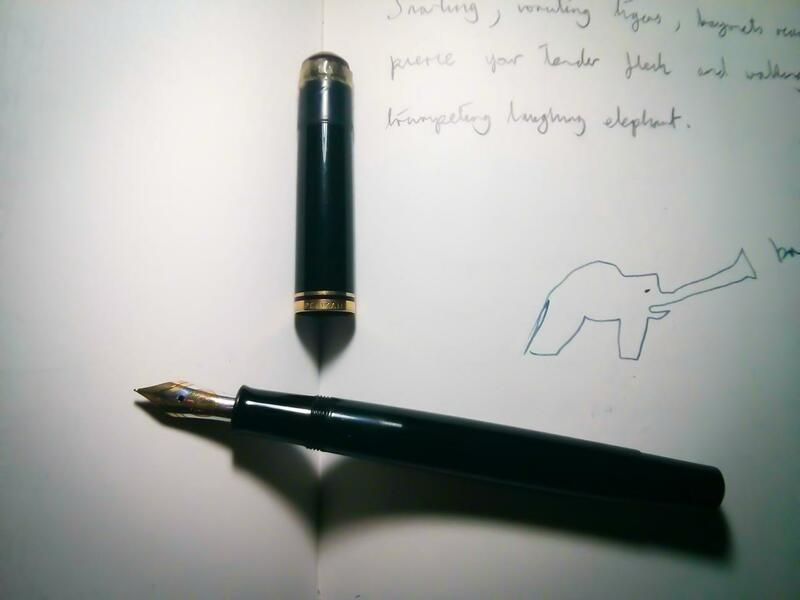 The fountain pen writes very smoothly, the ink flows freely and it’s extremely comfortable too. I can’t recommend it highly enough. The plastic feels to be of high quality, it’s durable, hard and the pen has a comforting weight to it. The cap fits on with a snappy click and can also be placed on the barrel when the pen is in use. A few times now, when talking and gesturing with the pen in hand has resulted in the cap falling on the floor. 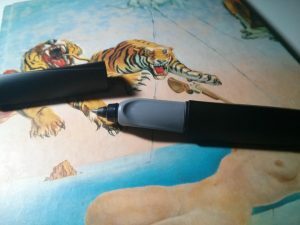 The rollerball differs in that the triangular grip has one side distinct for the placement of the thumb, but whichever way it’s held it a lovely comfortable writing experience. The minimal packaging does not include instructions, it is necessary to load both ink cartridges into the pen. 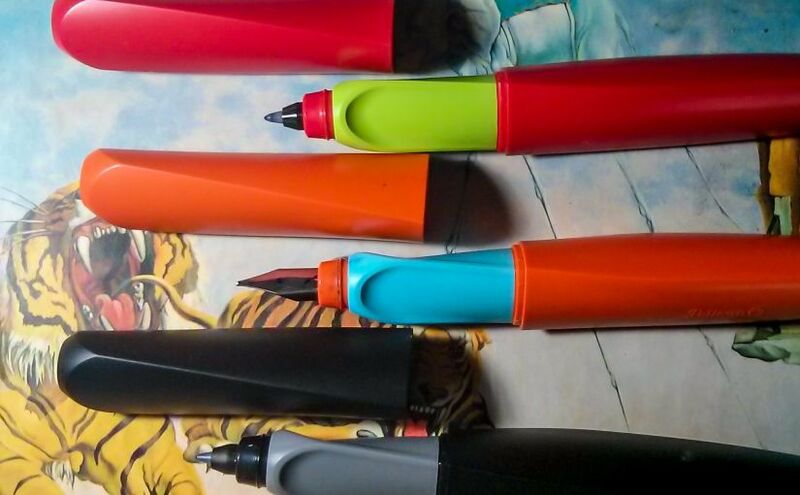 You don’t hold these pens, it’s as if they sit in your hand. They haven’t done anything to improve my handwriting by the way.